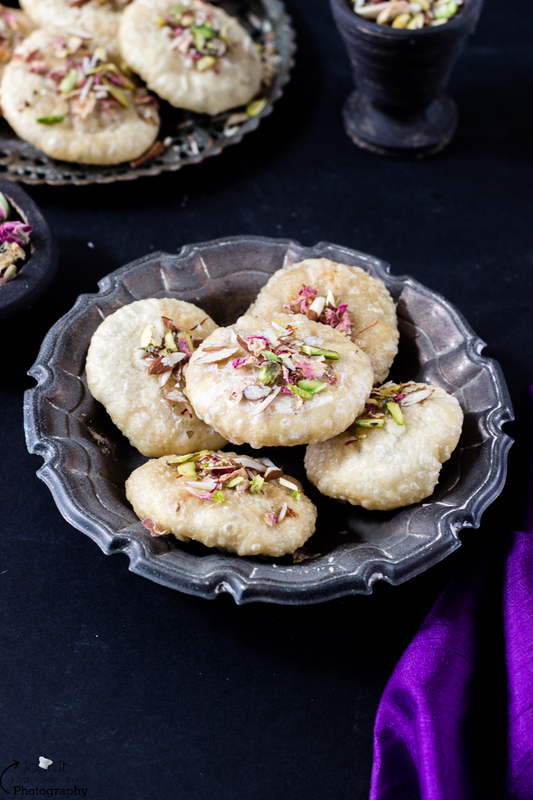 Meethi Khajalis are a traditional sweet Gujarati snack. Meethi Khajli is deliciously crispy outside and delightfully flaky and melts in your mouth. 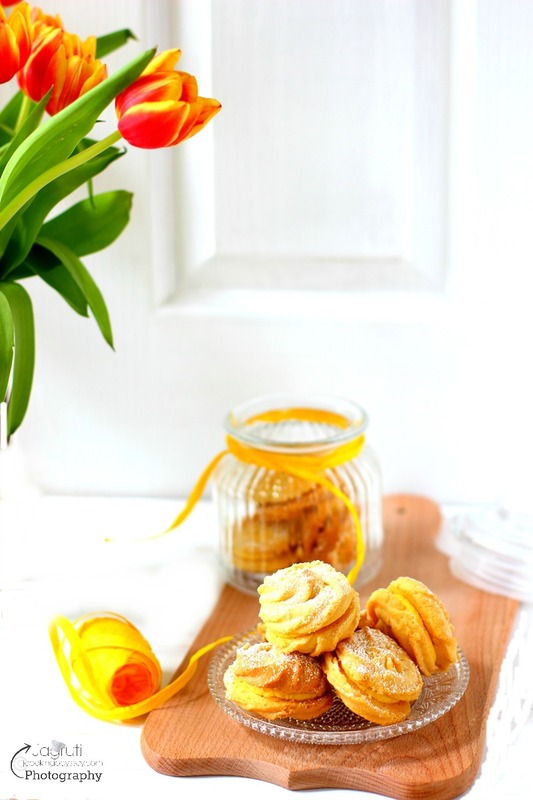 Perfect as a snack with hot beverages or serve as a sweet or mithai. Although Khajali is considered as snack but sweet ( Meethi ) Khajli remains the most favourable choice for festivals and happy occasions. The Meethi Khajlis are popular past on as a goodwill gifts on Dusserha as especially in Gujarat. As soon as Navratri festival comes to a close ,thereafter begins the ,Dusserha (aka) VijayaDashmi. This popular Hindu festival is widely celebrated across all region of India and across the world too by Hindus. The festival that celebrates the triumph the good over evil. The myths associated with this festival is that Lord Rama fought the ten headed demon Ravana in order to save his wife Devi Sita, who was kept captive in the demon Ravana's kingdom of Lanka. To rejoice in the glory of Lord Rama, most regions in India observes this day is a public holiday and also street plays ( aka ) Ram Leela are organised and in the evening large statues of demon ravana constructed and these effigies are burned to conclude the festival of Navratri and Dusserha. 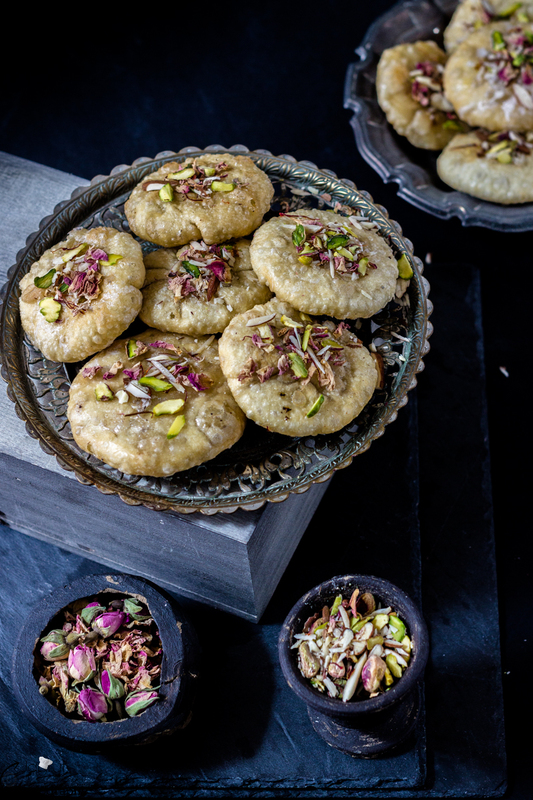 In India, every festival as grand festival when it comes to food, Indians celebrate Dusserha full to the brim with delicious and scrumptious sweets and mithai. 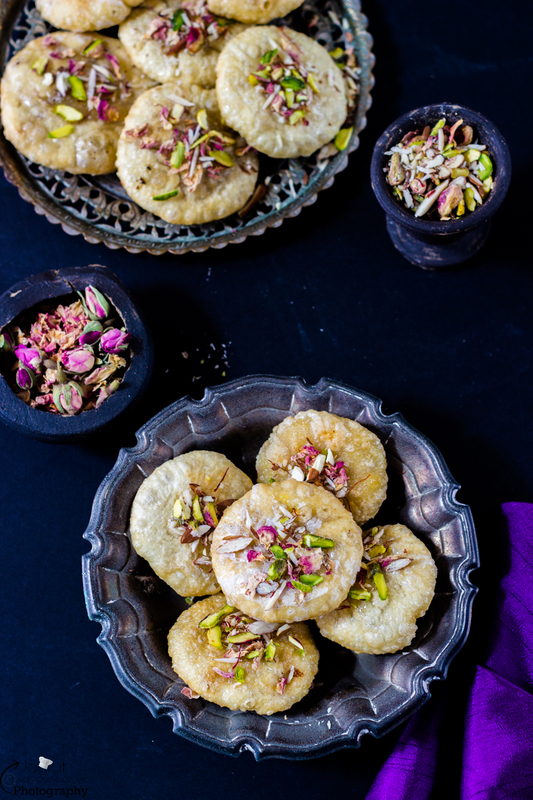 So here I have Meethi Khajli recipe for you to celebrate this great festival, Meethi Khajlis are great for any occasions !!! If you are in a mood for Masala Khajli, go ahead and check it out . Wishing one and all a very happy Dusserha ! Add melted ghee and rub the flour with your fingers. Combine well. and knead the dough with the little water. Don't heat oil on a high heat. Divide the dough into equal golf size balls. Flatten one ball on the worktop and press it with your fingers and make couple of holes in it, so it cooks well inside too. Work same with the remaining dough. Gently pressed slip pressed khajali into hot oil , fry the khajali on a low heat until you see flaky and light brown colour khajali. Once done leave it to cool completely. Now make sugar syrup by mixing sugar and water in a pan. Make 2 thread sugar syrup. 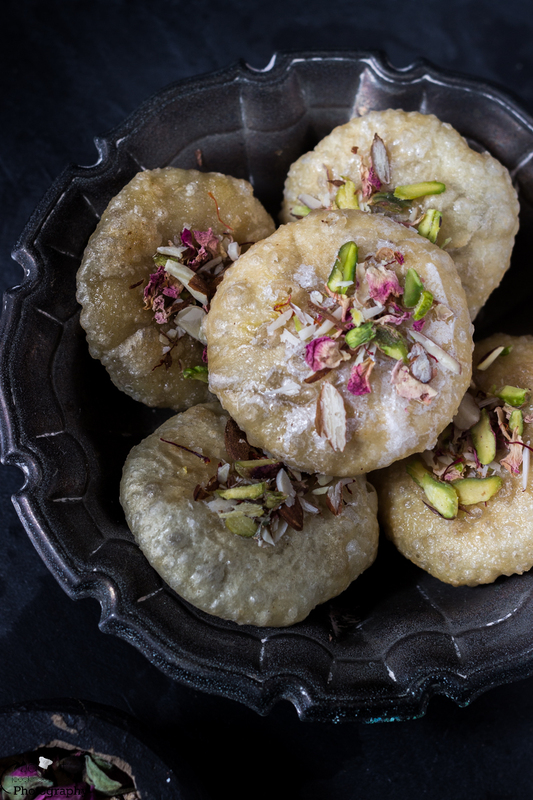 Now quickly drop each khajali one by one in hot sugar syrup and coat completely and put them on a greased baking sheet.